Cheap Customized Shopping Bags, Personalized in Bulk or Blank. Promotional, Royal Blue, Red, Kelly Green, Tan, Poppy. Covered Bottom Insert, Water ReSistant. Best price in USA, Canada. On Sale today! 30% off. 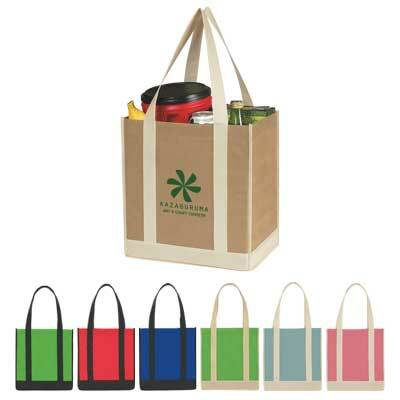 Bulk 2 Tone Shopping Bags, custom imprinted with your logo. We also supply blank (not imprinted) wholesale 2 Tone Shopping Bags. Budget Prices in USA and Canada for wholesale promotional 2 Tone Shopping Bags. American clients pay no taxes.